HOW in world have I lived so long without a painting rack? In less than 2 weeks, this piece of organizational heaven has revolutionized my studio space. Amazing, just amazing!! I have had several semi-completed paintings stuck here and there, so it helps me to protect them from nicks and scratches, plus I'm able to see what needs to get done...it stays in my face and I need that to keep me on target. 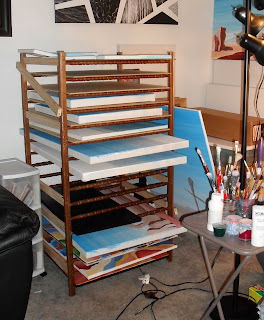 Right now, I use the top 3 slots of the rack to store the small paintings while they dry on MDF boards, but I may increase that to 4 if I start another small painting series.